Locks & Catches > Locks > Misc. 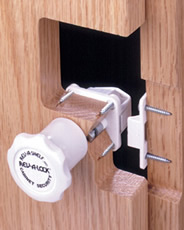 Rev-A-Lock and Tot-Lok security system is an ultra-secure, magnetically operated lock designed to make it virtually impossible for children to break into cabinets and drawers containing unsafe items. Only the extremely powerful magnetic key can open the lock. Full 1/2" lockbar throw for doors up to 102" tall. Lockbars can be trimmed down for shorter doors. Requires a 16.5mm lock hole.